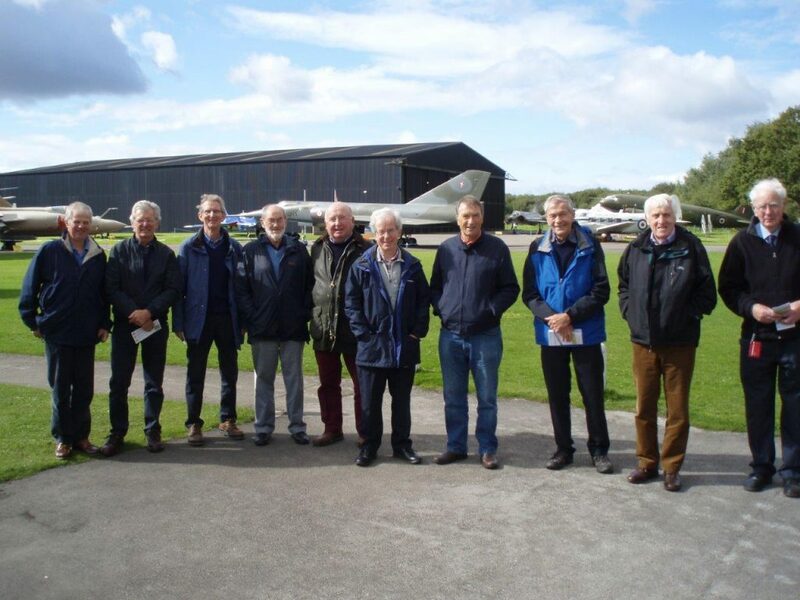 A small bu t select group of Stumperlowe Probus Club mem­bers enjoyed an inspir­a­tional and at times emo­tional visit to the former RAF Elvington air base near York which now houses the Yorkshire Air Museum or, to give it its full name, the Allied Air Forces Memorial and Yorkshire Air Museum, on Wednesday, September 13. Our select group, minus the pho­to­grapher of course, with some of the exhib­its on show behind us. As with other visits in the past, for example to the National Rail Museum, the four and a half hours we had allowed proved barely time enough to explore all the exhib­its, indoor and out­door, as well as the archive mater­ial and cinema screen­ings, not to men­tion a lunch­time visit to the NAAFI where many of the British and French air­crew lost during World War II would have enjoyed their last meal. No 77 Squadron suffered heavy losses during its time at Elvington, with over 500 air­crew killed, miss­ing or taken pris­oner and almost 800 Halifax bombers lost as it played a major part in the Battle of the Ruhr and the bomb­ing of Berlin. In May 1944, 77 Squadron moved to the newly opened nearby RAF Full Sutton and was replaced at Elvington by two French squad­rons, num­bers 346 ‘Guyenne’ and 347 ‘Tunisie’ who both played lead­ing parts in the bomb­ing of Germany. 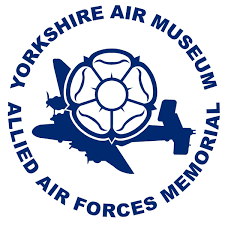 Elvington is the largest ori­ginal war­time RAF Bomber Command sta­tion open to the public any­where in the world. Retaining the authen­tic atmo­sphere of an oper­a­tional base, the site con­tains the 77 Squadron Memorial, the French Air Force Memorial, the Royal Canadian Air Force Memorial, the Commonwealth Air Training Plan Memorial and the Air Transport Auxiliary Memorial. 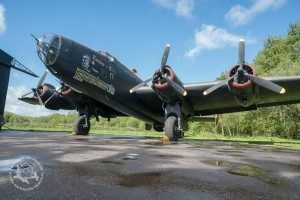 Elvington was the war­time home of the only two French Air Force Heavy Bomber Squadrons, who flew the huge Halifax four-engined bomber on mis­sions over occu­pied Europe. The museum, which is held in spe­cial affec­tion by many vet­er­ans and the des­cend­ants of those brave airmen , has there­fore enjoyed a unique rela­tion­ship with the people of France, and the French Air Force and gov­ern­ment, since its found­ing more than 30 years ago. Of the out­door exhib­its, the high­light for many was the French Mirage IV nuc­lear bomber which had been offi­cially inaug­ur­ated at its new home at Elvington only ten days earlier. The Mirage, which was Western Europe’s fast­est mil­it­ary jet cap­able of sus­tained speeds of Mach 2.2 (1,400mph), was trans­por­ted by road on a four-day jour­ney from the Chateaudun air base in France. The new attrac­tion, which was first pledged to the museum by the French gov­ern­ment more than 12 years ago, was offi­cially unveiled on September 3 by Général Laurent Lesellier, rep­res­ent­ing the Chief of the French Air Force. It joins the much smal­ler Mirage III fighter which is also the only one of its type in Britain. The Elvington museum opened in 1985 and had only a hand­ful of air­craft to dis­play. In those early years, volun­teers were con­cen­trat­ing on refur­bish­ing the cent­ral build­ings of the ori­ginal war­time site as well as focus­ing on restor­ing an ori­ginal Halifax bomber. The French vet­er­ans who, 40 years after the war, were still very active, were anxious to help and to ensure that their own his­tory within RAF Bomber Command was not for­got­ten.